Windows are barriers, lattices with illusions of transparency, filters we use to separate interior and exterior space. They keep out enemies, the hot and cold, and shut us in. China Obscura's windows are metaphors for the screens culture creates – decorative and at times structural barriers that let selective information into and out of a protected space. Every culture is a universe of traditions, both codified and fluid. When we look at another culture not our own, we bring assumptions and history that prevent us from seeing it clearly. 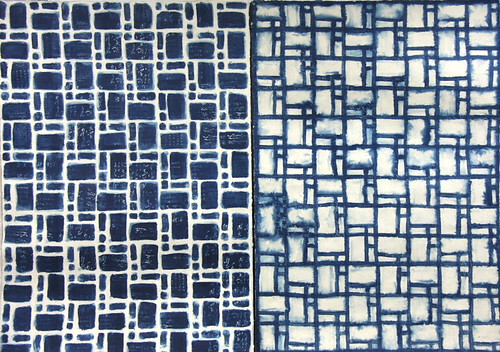 These Cyanotype paintings are views of rooms in China where pivotal people stayed, slept, and worked to change the country's future. China Obscura explores the contrast between outsiders' perceptions of 'the foreign' or 'exotic' versus insiders' familiarity, rather than legacies of the personalities involved. 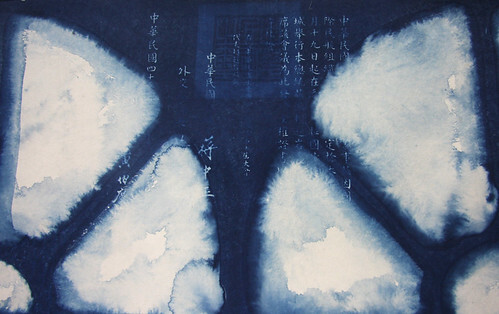 Words written by, about, and to these famous figures are appropriated by the artist and printed with sunlight into photosensitive Cyanotype chemicals. Text becomes texture; script adds new, sometimes conflicting, dimension to the images. Words fade in and out like memories and meanings that shift over time. Most of the artworks are diptychs. One painting looks at the world outside, the other has a view to the interior: opposing sides of the same structure. In Mandarin, the polite way to say '[western] foreigner' is "outside country person", which hints at the historic insulation of the country. Foreign perspectives of China – those from outside – are inherently incomplete. Paper was commissioned from Idin Papermill, Thailand. Every sheet was made on bamboo screens, and varies slightly in size and shape. Like most things handmade, the paper's edges are irregular. So too are the painted architectural shapes; the effect is of instability and motion, edges that blur divisions between wood and windows, sky, tiles and stone. The paints are photosensitive iron salts, a pale green when freshly applied in semi-darkness. Splashes and irregularities are part of the painting process. Every brushstroke is nearly invisible when fresh; the final dark blue color appears only when artworks are developed in the hazy sunlight of Beijing. The images are all one of a kind, and are not prints, but individual paintings. The catalog is available from Pixalib books.